> Amber Ware>Necklace "Nordic Gold"
Not without a reason the ancient Greeks and Romans treasured amber calling it “the gold of North”. This royal amber necklace attracts by its proportion and forms. 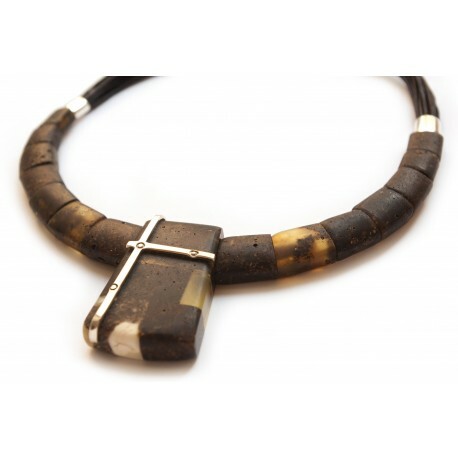 Matted, polished, soil shades, massive amber pieces give the necklace the sense of power and strength. The central part of the necklace is decorated with silver details. Unpolished, natural black and white amber combination with silver decorations. An amber necklace of a unique design, fascinating with its naturalness and elegance.